Fixing an Ethernet Cable with Zip Ties! We’ve all been there. You just finished that important email, only to find you’ve lost Internet. After a computer restart and a ‘friendly’ smack on the side of your router box, you realize the culprit. That old Ethernet cable has fallen out from its slot, all because the pesky little plastic clip has broken off! Before you make a mad dash to the store to pick up an overprice replacement cable, head to the toolbox and grab some cable ties. With just two ties you can get your Internet up and running again in no time. For this quick fix, you’ll want to start with the smallest zip ties you have. Miniature ties work best, but you can use any length you like as you’ll be trimming them down regardless. Step one is to trim down (and file for added precision) the head of one tie to match the thickness of the original cable clip end (so it ultimately fits in the slot on your computer). Use a suitable utility knife for trimming and a metal nail file for filing. Next, you’ll want to shorten the tie whose head you just filed. Cut the tape portion of the tie to around 2 inches. Scissors will work just fine. * We can’t stress this enough, but please exercise caution when using sharp tools to modify cable ties! Next comes a bit of a song and dance, as we will be combining the ties to replicate the clipping mechanism. Take the unmodified cable tie and wrap it around the cable, just behind the cable’s plastic end. Before you tighten, loop the shortened cable tie under the tie you just wrapped around the cable, making sure you insert the tail pointing toward the end of the Ethernet cable (where the broken plastic clip is). Now tighten the tie holding our trimmed tie in place. If you’ve done this correctly, you should be able to push down the modified head so that it rests on the plastic end of the cable where the clip originally broke off. It’s usually a good idea to cut off any excessive tape length on our unmodified tie, which is holding the “zip tie clip” in place. 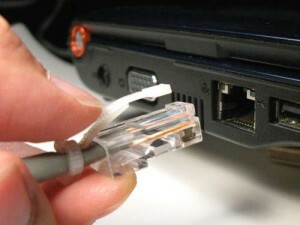 Now, while continuing to push down the filed (or trimmed) cable tie head, slide the cable into the appropriate slot on your computer or router, and there you have it! An Ethernet cable that fits snugly and won’t slide out during use. Now of course, this isn’t a permanent fix, and you’ll have to reapply pressure on the apparatus to reinsert the cable. But, with just a few zip ties from Cable Ties Plus, you can be ready for an unfortunate cable failure, helping you get online and back to work.